Surface finishing | HANAKOV, spol. s r.o. 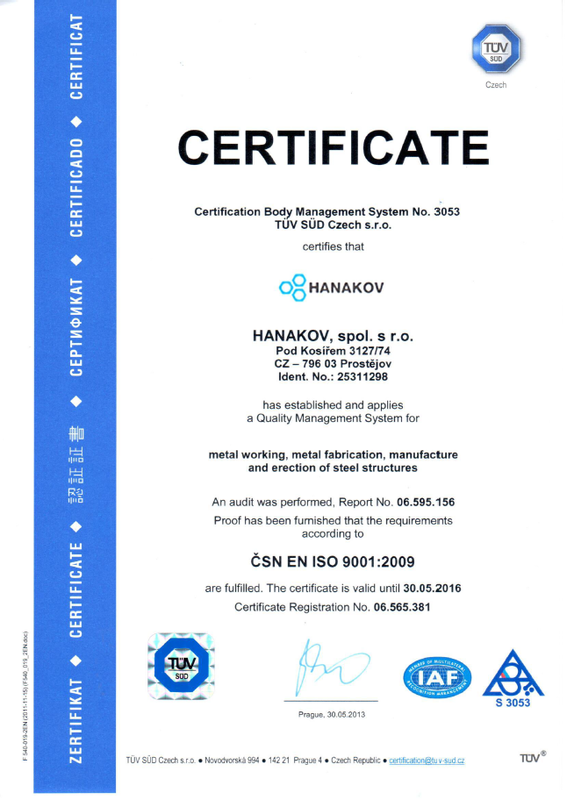 Surface finishing – HANAKOV, spol. s r.o. Surface treatment is a special treatment of materials by processing or application of another material layer by means of the chosen technology. Particularly, it is used to increase the resistance of the material surface against corrosion, abrasion, increased temperature, etc. Similarly, it improves mechanical, chemical, aesthetic and other properties of the surface. In our centre of metal surface treatments, we execute blasting, and then the final treatment by wet painting or metallization; that is, zinc coating in the required thickness or Schoop plating. Before the final product treatment, the required part surface must be cleaned by blasting, roughened or adapted in another way. The stationary blasting device used in our company (blasting box – blaster) is based on mechanical projection of abrasive particles with slinging wheels. The objects (products) blasted in the box are suspended on hooks of an electric hoist, which are rotating during the cycle, simultaneously moving horizontally before the slinging wheels. Pressure air is supplied to the blaster from the pressure chamber. The blaster air is filtered in an ecological filter with a fan. The abrading agent used is mostly recycled. The entire blasting process is automatic. Wet painting (use of “wet” paints) is a standard as well as economically profitable way of final treatment of steel assembled structures and products for which a more universal utilization and aesthetic quality is required. The aesthetic value of the product increases its purchasebility. We keep at our disposal a workplace for execution of surface treatment metallization (so called Schoop plating) – by application of fused metal on the surface. Thanks to the modern technology of electric metallization, we are able to provide for high quality of the coat rendered (high adhesion and resistance of the paint) even at high output of the workplace with simultaneous low operating costs. Moreover, we perform classical gas metallization, when a non-corroding metal is applied by spraying by means of acetylene flame and pressure air. If you are interested in the possibility of Surface treatment in our company, please contact us by means of the contact form or contact our sales department. After you send us an inquiry, we will be glad to propose a technology and work out a quotation for you.